Yesterday, Google announced it would be replacing Android Market with a newly named service called Google Play. The company claim this is more than a name change. The Google Play Store not only replaces Android Market, but also extends it, adding other types of digital content such as eBooks, music, video content and more. Under the Google Play label, the company hopes to consolidate all of its purchasable digital content under one umbrella. The search giant says the change will expand the reach, content and monetization of their online market place. Google's biggest mobile competitor, Apple, already employs such a strategy with its iTunes store which offers digital books, apps, music, movies and more. The transition to Google Play will be seamless for Android users. An OTA (over the air) update is currently being pushed out to all Android devices running Froyo (2.2) and up. 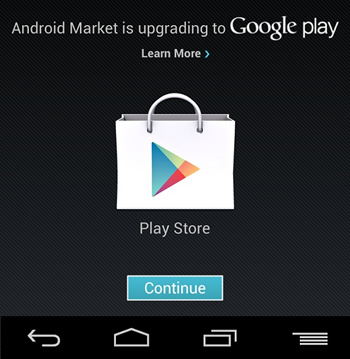 The update will upgrade users' Android Market apps to the new Play Store app. Users who have an older or otherwise unsupported Android device will continue to have the "same access to their apps as before". However, Google did not specify whether or not users who don't have the Play Store app can still make purchases or not. Additionally, Google says it will be investing in the brand, working on providing fresh content but also remain focused on apps and games. The mention of "fresh content" may hint at ongoing content deals with networks, publishers and music labels. This could very possibly be good news for Google TV, but also for shareholders who want to see the company both innovate and expand.